When I think back to my favorite childhood snack, this simple and classic grilled cheese comes to mind. My Grandma, or Meme as I would call her, would make me this easy little dish all the time. And still to this day the melted cheese, the salty tomato, and the crisp buttery bread make me feel happy and comforted. And even though my Grandma probably only ever used cheddar, I've begun using fontina because it melts beautifully and the flavor is remarkable. Beecher's Cheese, out of Seattle WA, makes this super special cow's milk blend called No Woman. It's sort of a sweet and spicy jerk flavored cheese that not only tastes amazing but also melts really beautifully. The green tomato jam was store bought, but if you'd like to try it out for yourself, I'd recommend following this recipe from Domenicacooks.com. This hole-in-one style grilled cheese has gruyere and tomato chutney. Big crispy slices of country-style bacon, fresh thick slices of salted tomato, sweet, crisp butter lettuce, and a basil aioli that makes you want to lick the bowl all come together between two buttery halves of a brioche bun. If you thought a regular old BLT was good, wait until you try this one! The beautiful thing about these sandwiches? Not only do they hold up really well, but they also taste better as it sits. I imagine this is a result of all the flavors melding and coming together over an extended period of time... eh hem more like everything starts to taste like bacon... but yeah, this is basically my favorite version of a BLT and I'm pretty certain you will love it, too. 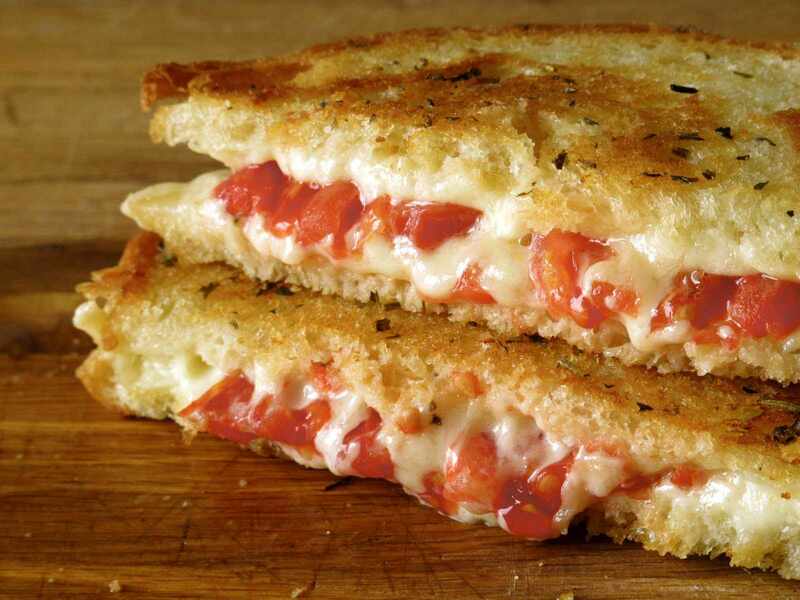 It makes sense that a caprese sandwich, typically made with tomato, mozzarella, basil, olive oil and balsamic vinegar, would translate well into a grilled cheese. Sure, the classic version is typically made on an un-toasted baguette but who doesn't like crispy grilled bread? Especially when it's rubbed down with fresh garlic. And you might be saying that fresh mozzarella doesn't really melt well - and, well, you're totally right. Fresh mozzarella doesn't typically melt unless it's heated for a long time. But if you're saying "Umm i want my grilled cheese to be oozing with molten lactose-goodness" and if you'd like some tips on how to do this, then go ahead and use some sort of low-moisture mozzarella or any of the shredded mozzarella that you find in your grocery's dairy aisle. It melts much nicer than the fresh version and it tastes pretty good, too. This sandwich doesn't really hold up past about 30 minutes so be sure to eat it right away! Wisconsin Cheddar, sweet and savory tomato jam, crispy bacon, and a runny egg yolk grilled between two buttery slices of brioche bread come together to make this insane breakfast grilled cheese. And let's face it, after making this recipe, your mornings will never be the same. Sweet and savory cornbread, milk-y queso fresco, and tangy and crispy fried green tomatoes come together to make this sandwich everything you've ever dreamt about. Eat it for breakfast, lunch, or dinner... or hey, even dessert! Breakfast on the go is easy with this creamy and rich grilled cheese! Alpine-style Alpha Tolman Cheese by The Cellers at Jasper HIllmelts beautifully alongside scrambled eggs and fresh slices of salted tomatoes. Hearty Texas toast helps keep everything glued together and the Garlic Habanero Hot Sauce adds an extra zing of flavor and helps awaken the taste buds early in the morning. This sandwich definitely will make your breakfast more exciting. When you think about open faced bagel sandwiches, lox, or smoked salmon, probably comes to mind. Now take that mental image and keep all of its deliciousness but swap out the smoked salmon for fresh slices of tomato and add everything bagel seeds to help make this open-faced sandwich even more next level. The cream cheese is great as-is, but if you're feeling a little bit more adventurous, add some chopped cucumber and fresh mint. You could even add some turkey on top for a little bit more protein. The possibilities of making are endless here! An inside-out-grilled cheese made with semi-sun-dried tomatoes, herb butter, olive bread, and burning melange gouda. It's crispy, crunchy, gooey, and oozey all at the same time. I'll be totally honest here when I say that it's hard to make a vegetarian sandwich that excites me (...unless it's a grilled cheese of course!) But it doesn't have to be like that! Say goodbye to lifeless limp vegetables and start piling on some pickled vegetables, some savory protein-packed hummus, and crisp, fresh produce. By switching up the veggies, you can create a sandwich that's anything but boring. A word to the wise though - the combination of the pickled beets and the hummus look awesome together -almost like art- but they also make this sandwich super messy so be sure to use the paper technique to keep the sandwich together. And yeah, you probably don't want this one sitting in a fridge all day, either. Beet hummus is the star of this healthy sandwich. It's beautiful and vibrant pink shade lacks in comparison to its healthy attributions. Beets are loaded with a variety of nutrients and fibers that can help lower blood pressure in just a couple of hours, fight inflammation and cancer, and can help boost your immune system. When you mix the roasted beets with chick peas, which are filled with healthy fibers, protein, nutrients and vitamins, the health benefits keep multiplying.